so delivery was about a month but the product is great sound is awesome, just press the on button to pair with ur phone n it works. sound is loud n mic is also good . other ppl can't hear it only u. Bone Conduction Wireless Bluetooth Hanging Sports Earphone 1pc - BLACK ONE-BUTTONso delivery was about a month but the product is great sound is awesome, just press the on button to pair with ur phone n it works. sound is loud n mic is also good . other ppl can't hear it only u. Good product with better battery than some others. Seems to hold its charge well unlike the first one I purchased from another Chinese website. Seems to also charge faster so overall very pleased with this particular bluetooth earpiece. As the product was described very nice made, good quality, very good sound from phone and pc after connecting it to the pc. It hold to the ear very good even when jumping. So im very happy that i trusted your web site and bought it. 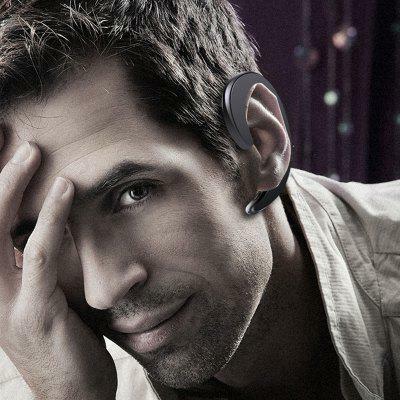 The Bone conduction wireless Listening device works wary well, comfortable, practice, the nay downside is they work one at a time and not in conjunction with each other from the same device. Easy to pair. sounds good not quite loud enough when out in car out around loud area! Still trying to get it to be louder.